A lovely romantic first-floor room with comfy Queen size bed, decorative fireplace, wooden plantation shutters and built-ins welcomes the morning sun. Visitors are invited to enjoy the light & airy, newly decorated room. Amenities include; a newly updated private bath (walk-in shower only) with Keurig coffee maker, alarm clock, wireless internet access, TV, cable and DVD player, hair dryer, luxury toiletries and linens. Air conditioning (Window units) is available during the summer months. 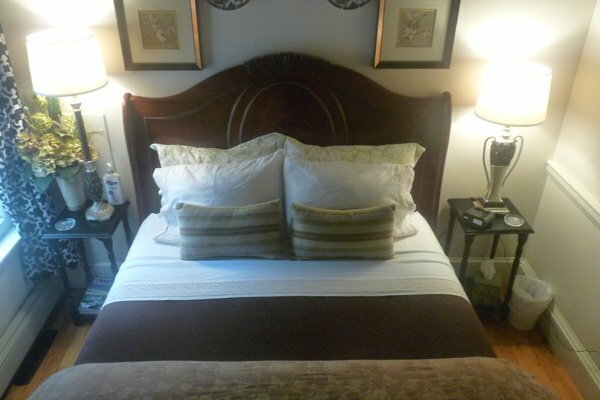 The Hamilton guest room is centrally located on the first floor. Complete with its own private outside access, window seat and wall to wall built-ins. The inviting Hamilton hosts a romantic deluxe queen bed and greets the morning sun. Featuring a lush Queen bed, flat screen TV, cable, wireless internet access and lots of character including a Napoleon Electric Fireplace. You will enjoy this convenient, comfortable and relaxing room with private bath (walk-in shower only). 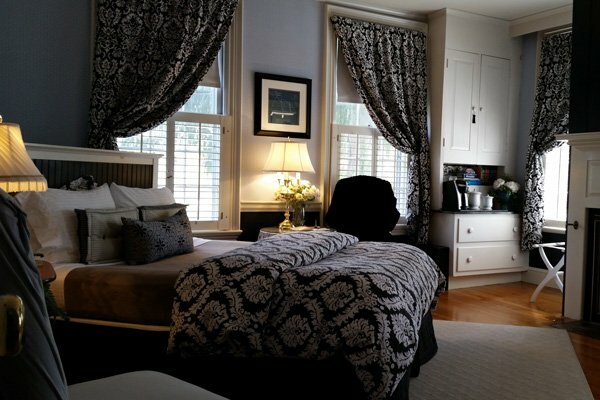 A Keurig coffee maker, alarm clock, hairdryer, luxurious toiletries and linens, and summer A/C window unit complete this room. 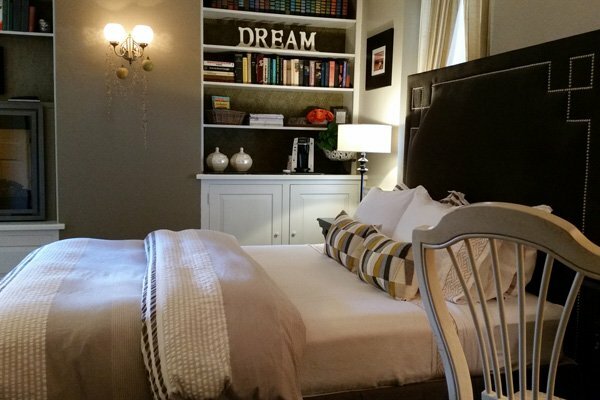 Many repeat guests request this romantic, beautifully decorated and comfortable suite. The Stoningham includes a generous sitting room and a guest room with an antique queen bed and newly updated private en suite bath. The sitting room is perfect for those on longer stays and provides a great space to unwind after a busy day touring Maine. Your private living room awaits you to enjoy a glass of wine or late night movie. The sitting room has an adjustable ceiling fan, TV, cable, DVD player and wireless Internet access with Keurig coffee maker, luxury toiletries and linens, and Air Conditioning (window unit) during the summer season. Our newest and more modern guest room, is a garden level King room located off the first floor. Note: there are four steps from the first floor level down to the garden level room. Perhaps the most private of all rooms, removed from the rest, the Brook Bridge offers both leisure and work space. The room features a king size bed, hairdryer, luxury toiletries and linens, desk, alarm clock, ceiling fan, cathedral ceiling, plasma TV, cable and Wireless Internet access. Air conditioning (window unit) during the summer season. Designed for both the business and leisure traveler, comfortable and relaxing for all travelers. 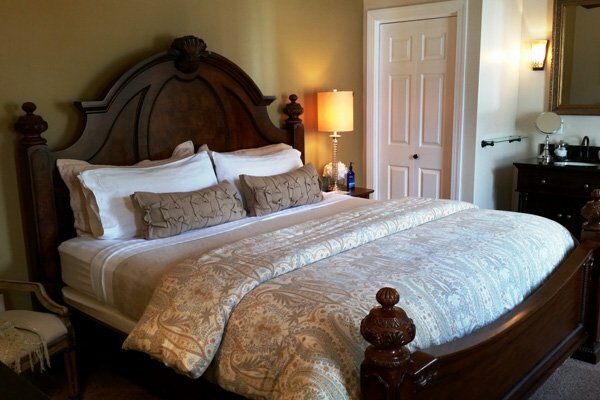 A highly requested guest room located on our second floor awaits the discerning traveler. A large spacious room surrounds a King size bed lavished with luxuries such as 600+ thread count linens. It is accompanied by a private complete bath. This over-sized room features a decorative fireplace to add to its charm. With sitting areas where you may certainly enjoy the 32" wall mounted Plasma TV with cable, DVD player and a Daybed with Trundle included with a Keurig coffee maker, alarm clock, hairdryer, luxury toiletries, wireless internet access and Air Conditioning (window unit) during the peak summer season. Double occupancy; additional adult guest $35 each and child guest $25 each. 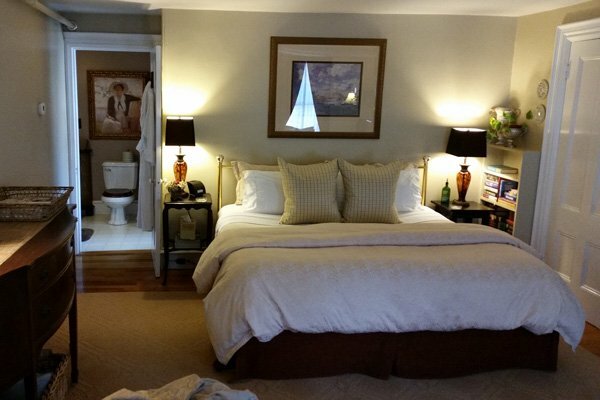 The delightful Amherst Suite is our largest suite of the Inn. A large corner living room with a "Jack and Jill" bath connecting to a spacious Queen guest room. 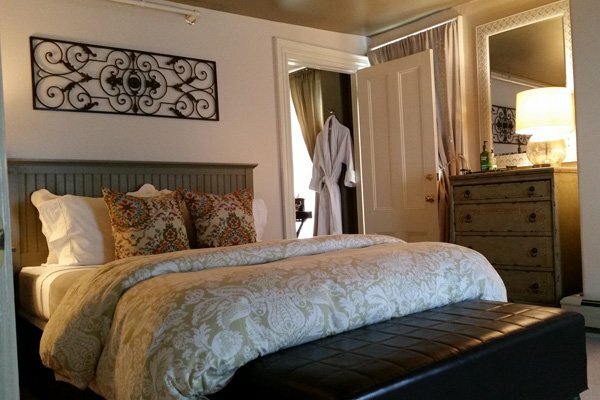 Located on the 2nd floor of the Inn, this sunlit corner room features a queen size bed and a large private full bath. Guests will appreciate amenities such as a private living room (with a pull-out sofa sleeper), a decorative fireplace and ample space to spread out and relax. The Amherst Suite has a 2 flat screen TV's, cable and DVD player, wireless internet access, Keurig coffee maker, alarm clock, hairdryer, luxury toiletries and linens, and air conditioning (window units) during the summer season. Double occupancy; additional adult guest $35, additional child guest $25.